Do you love DIY's just as much as I do?, If the answer is yes you'll love this one. Credit for this DIY comes from www.instructables.com. Yarn or String. Thickness may vary to add a different look. Newspaper. This is used lay down while spraying the jars. Cut long strings of yarn, enough to go around the jar multiple times. 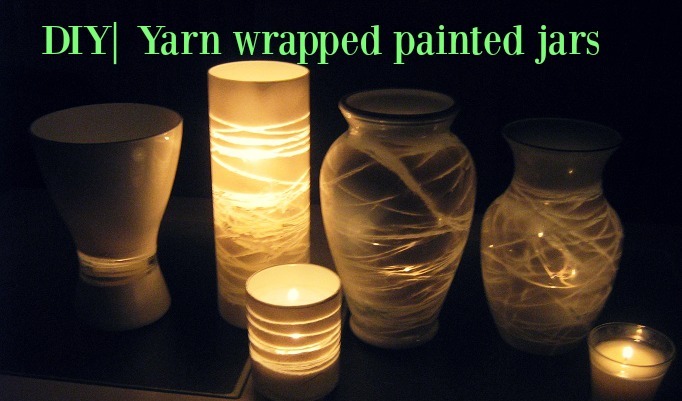 Wrap the yarn around the jar; make sure to leave the start open for tying off at the end. Once done wrapping, tie the end with the start to keep the pattern. Cut off the extra yarn from the knot. Lay down paper or newspaper for your painting area. If needed put blocks on the corners of the paper so they do not roll up. Space the jars out, at least a foot apart of each other. This is so you can fit the spray can in-between the gaps and one jar doesn't get more paint than another. Cut the yarn at the end of the string by the knot for best results and easiest for removal. *Be careful not to hit the jar with the scissors. Un-wrap the yarn from the jar.